"Yeah, the company put up me in a motel this time....." my colleague said with a disparaging tone. Even I was a bit surprised as it was standard for colleagues to be housed in hotels, and to top that, the hotel was in a really unsafe part of town. Obviously, the company was on a tight budget and wanted to save money when sending employees on assignment. In 2015, I stayed in a few really nice motels in good neighborhoods in the U.S. and began to wonder what the real difference was between a hotel and a motel. As this question sometimes comes up in cross-cultural training programs for the to-be expat workers preparing to go onsite to the U.S., I began to seriously ponder this difference. In the video below I share some of my thoughts on three differences I see between hotels and motels from a purely lay person, customer viewpoint. Authentic Journeys' YouTube page and subscribe today. Note: In the video I discuss the lack of exterior walled hallways in motels. In fact, I read up on this and many motels built after about 2009 may have closed exterior hallways as it increases guest safety in many instances, as well as saves on heating or cooling costs. What other differences have you seen between hotels and motels? Or, do you think they are pretty much the same? 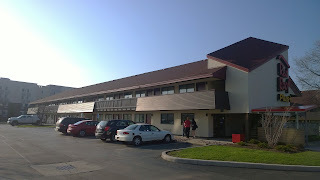 Have you stayed in motels while coming onsite to the US? What is your opinion? Feel free to share your experiences below. Author of this post, Jennifer Kumar, provides guidance to prospective expats going to the U.S. on temporary or long-term work assignments. See our programs or get in touch to get started today. Note: Authentic Journeys does not endorse Red Roof Inn or any particular chain of motels or hotels. Authentic Journeys is using this hotel as an example for purposes of the video only. Authentic Journeys is not gaining royalty off mentioning this particular location or Red Roof in general. Note: Authentic Journeys' can provide cross-cultural training to expat residents of your U.S. based hotel from other countries. Contact us for more information or to start a discussion on this today. Save money on hotels in the U.S.